Getting a list of keywords with a big monthly search volume and low competition is the key factor to building a successful online business. If you are doing PPC promotions, low competition keywords allow you to keep the CPC at low values, thus getting more profit. And if you are investing in SEO, it’s much faster and easier to get great results by targeting keywords that very few people know about. Keyword research is an art in itself, but the good news is that I have written a detailed guide that teaches anyone how to do keyword research and analysis. This time I want to show you another keyword research method that complements my guide, offering you the possibility of getting thousands of great keywords ideas in less than 30 minutes, by spying on your top competitors. How do you get access to this useful piece of information? Simply point your browser to the desired website, wait for the page to load, and then right click an empty page area and choose “View Page Source” or “View Source”, depending on your browser. A fresh window will open up; scroll down until you see the <meta name = “keywords”… line of code, and then copy and paste all the “content” that can be found on the same line of code – that is your competitor’s keyword list. As you can guess, this method has been used and abused, so many website owners now hide their meta “keywords” on purpose. In fact, most business owners are afraid to display their keywords because somebody else might get them and outrank their websites. You won’t lose too many things by choosing to hide your keywords; Google stopped using the meta “keywords” as a ranking factor many years ago. It’s true that some of the old search engines continue to take them into account, but those search engines are used quite seldom, so they aren’t reliable traffic sources. This blog isn’t discussing old, tired online marketing methods, though; we are going to use innovative ideas and tools that get the job done for us. And when it comes to sourcing data from Google, the most reliable tools are the ones produced by the search engine giant itself, wouldn’t you agree? I don’t want to reveal your best keywords by accident here, so let’s focus on the SEO niche. I will run a “seo company” Google search (without using the quotes), writing down the top 10 URLs. Log into Google AdWords, and then choose the “Search for new keyword and ad groups ideas” option from within the Keyword Planner tool. Paste the website URL of your first competitor in the “Your landing page” field, and then press the “Get ideas” button. Click the “Keyword ideas” tab to get a list of keywords that Google considers to be relevant for that particular website page. Download the keywords in the Excel CSV format by clicking the “Download” button in the upper right corner of the screen and choosing the proper option. Repeat the process for the rest of the URLs; feel free to ignore one or more of the top10 results if you believe that they aren’t relevant for your industry (believe it or not, even Google can make mistakes from time to time). OK, so now we have a list of up to 10 csv files, and each one of them contains hundreds or thousands of keyword ideas from our top10 competitors – how do we move on from there? Basically, this command will merge all the content inside your 10 csv files into a giant “master.csv” file that can be opened in Excel or any other spreadsheet editor (the free ones that are available in Open Office, LibreOffice, etc will work fine as well). Time to do some cleanup! Open the master.csv file in your spreadsheet editor, and then sort the “Ad group” column alphabetically; this will put all the headers at the top, allowing us to keep a single header copy. Now that we have gotten this problem out of the way, I see that my csv file contains exactly 7570 keywords, but many of them are overlapping, because they can be found on several competitor websites. 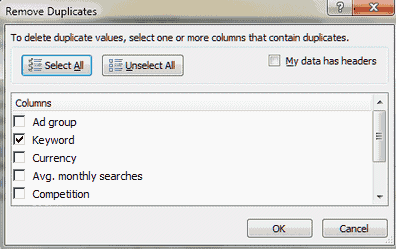 We need to remove the duplicate keywords, and this task is easy to do with Excel’s Data -> Remove Duplicates command. You should only remove the duplicates from the “Keyword” column, though. Now that our csv file is cleaned up (it’s down to 4185 unique keyword ideas) the time has come to sort it using the “Suggested bid” column, with the CPC values being sorted in descending order. Here’s how my spreadsheet looks like now. Who would have thought that many companies will pay about 100 dollars to get a visit from a person looking for an “internet design company”? It is true that the monthly search volume is very low, so I wouldn’t go after that keyword. 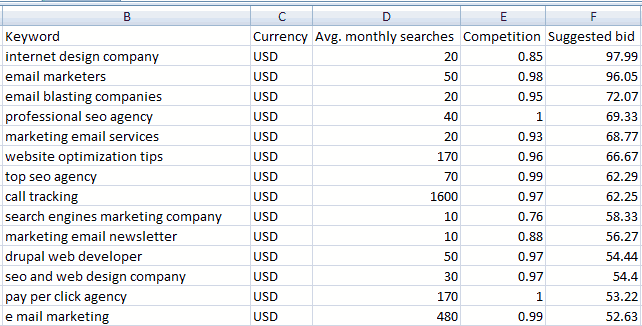 Your job is to go through the keywords on the list, picking the ones that have a decent monthly search volume and a big CPC value. This may not sound that good if you promote your business using AdWords or other PPC networks, but the truth is that these big CPC keywords convert very well; otherwise, the advertisers wouldn’t pay that much money for a single click (not necessarily a product sale!). Set a limit for the CPC value, and then go through the keywords one by one, picking the ones that are relevant for your business. The same rules apply if you use SEO services to promote your business; find all the keywords that have 300+ monthly searches, create content around them, and then start promoting those pages. Use the allintitle: operator to assess the competition strength for each golden keyword, and stay away from keywords that have over 50,000 direct competitors. Here’s an example of a decent SEO keyword, which has 390 monthly searches, a $34.72 CPC value and only 5,490 direct competitors. Don’t forget to evaluate the strength of the top competitors before starting to optimize your website for the new keywords, though; as you can imagine, the top 10 results will not be identical with the ones in the original top 10, which has helped us gather all these keywords ideas. Don’t ever skip this step; sometimes you will discover that some of the keywords that report small allintitle values have a very strong top 10. Looking for even more info on keyword research? Check out the 101 White Hat SEO Tips article; the “Keyword Tips” section has several powerful tips.